Welcome to the first edition of a brand new series on Happy Food, Healthy Life, called Motivational Mondays. Mondays are hard. We can pretty much all agree with that. There’s a lot going on, and sometimes you just need a little push in order to get you going. Also, you don’t usually have a whole lot of time. I was looking through some of my pins on Pinterest, and thinking about how much many of them are going to waste. I see a lot of really motivating quotes and words of advice that I would love to be able to share with you in a personal way. So this is how it’s going to work. Every Monday, you can count on me to provide you with a quick and to-the-point post focusing on one quote or idea that I saw that I thought could benefit you. I’ll elaborate quickly and send you on your way. This won’t take much time, and it will get you starting your week on a positive note. Sound like a plan you can work with? I sure hope so, because I’m pretty excited for it. So let’s get started with today’s piece of motivation. We all dream. Well, I know I do. I’m the biggest daydreamer there is. I can sit and stare out the window for hours thinking about all the things I wish for my life. I can see my dreams in detail. The specifics of each and every puzzle piece. I’m sure you’ve been there too. But then what happens when you come back to reality and find yourself back in your normal life? If you are life most people, you go right back to living the life you’ve been living for years. You’re not taking any active steps to reaching your dreams! Reaching your dreams can be possible! Some of them are harder than others, but if you can dream it, chances are, you can live it. You just have to work for it. You have to take the active steps that will get you on your way to achieving your dreams. This is where I’d start. Start with one dream. 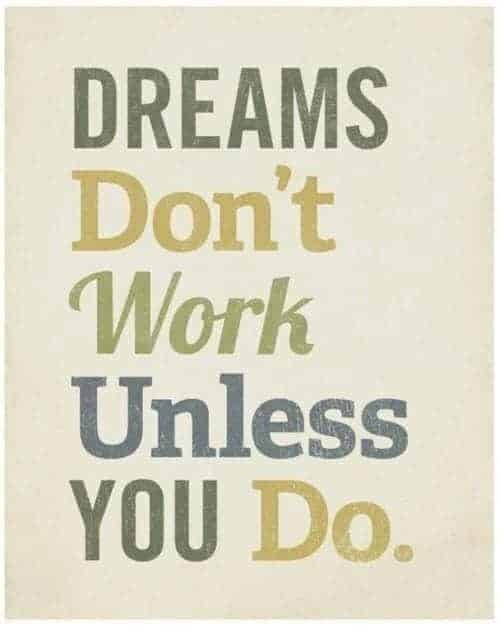 And then make a list of all the things you need to do to get to that dream. Maybe the very first step is to gather more information before you even know all the steps. So start there. Gather information and then work on your list. Little by little, you will start checking things off of your list, and you will be well on your way to reaching those dreams. Just don’t forget, day dreaming about the things you would like to achieve is so fun, but it won’t get you anywhere. You must do the necessary work. I hope you have enjoyed the first edition of Motivational Mondays, and I hope this is enough to get you moving and on your way to a successful week! What is one of your dreams and what is the first step for you to achieve it?